The first days of January brought strong gusts of wind, then humidity. February saw premature mild spring temperatures, despite some morning frosts at the end of the month. Bougies were set out in the April humidity, and we feared the spring frosts that had been so devastating the previous year. Fortunately, there were no frosts in 2018, although the first two nights of May looked to be risky. The mild weather continued, and the vines grew quickly. Flowering began on 25 May, and was a sign of the early harvest to come. Green harvesting soon followed during the month of June, and by 21 June all the trellising work was finished! The summer brought plenty of warm sunshine, which continued throughout July, August and September. The dry weather kept parasites at bay, especially mildew and powdery mildew, which meant that we could hold off on vineyard sprays and stop protecting the vines early in the season. Only a few storms punctuated the endless summer, and two instances of hail in the Butteaux vineyard served as a reminder that we’re never safe from the vagaries of the weather. The drawn-out dry period meant that fruit development slowed in late July. Veraison gradually developed around 25 July. The vines languished in relentless heat during early August, and some signs of scorching were even found in various spots around the vineyard. The first samples of grapes at the end of August showed high potential alcohol levels, indicating that the start of the harvest wouldn’t be too far away. 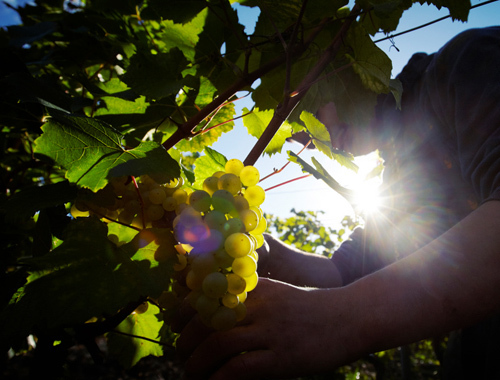 The first grapes were picked on 5 September in ideal weather conditions, despite some interruptions when temperatures became too high, and went on until 12 September. The 2018 vintage is one of high quality, and high volume.